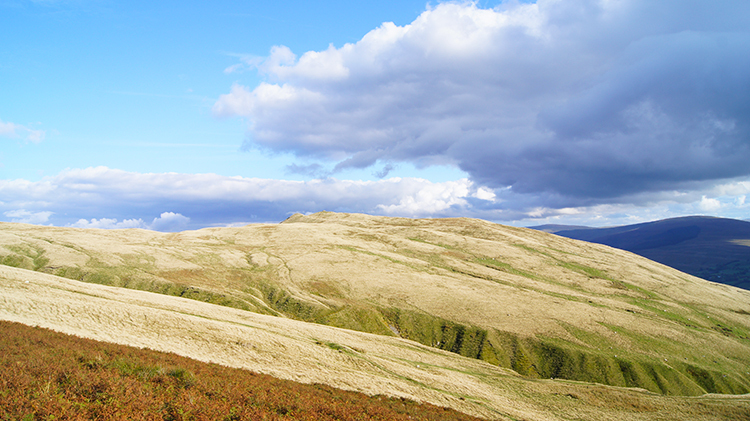 Summary: This walk entails a full day out walking across the magnificent Howgill Fells. At over eighteen miles and with over 1,700 metres climbing it falls into my strenuous category but it never really felt that way. Except for the initial climb from Sedbergh to Winder, the climb out of Bowderdale to Randygill Top and the steep climb up to Yarlside from the saddle with Kensgriff everything else on this Howgills exploration is a joy. 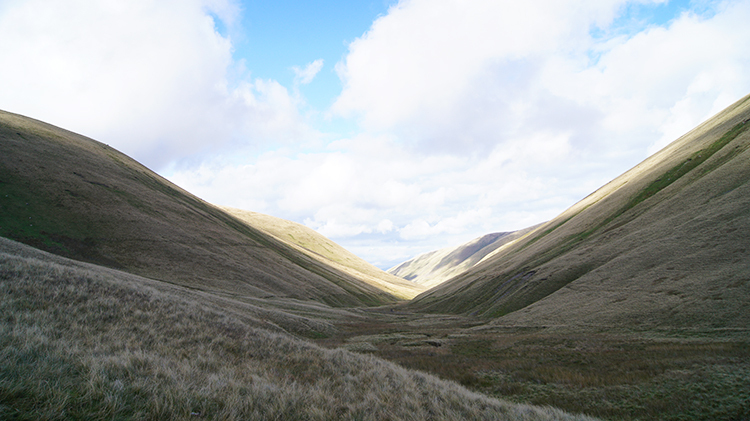 Most of my day was spent in complete delight on a beautiful Autumn's day by strolling across the beautiful rolling hills of the Howgill range. 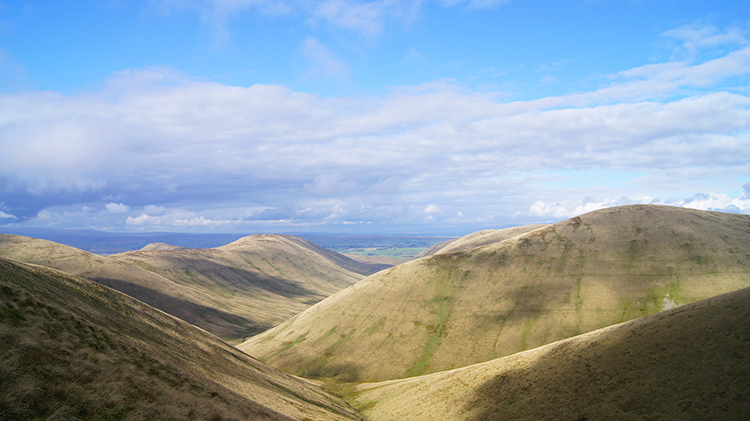 Nine hours passed in no time at all, such was my pleasure throughout this epic Howgill Fells walk. The Walk: I was staying with friends in Ingleton for a week so the journey across to the lovely town of Sedbergh at the south tip of the Howgill Fells. Staying with my friends allowed me to pick my day and also to make an early start. I choose a bright sunny Thursday in early October and after making my way from Ingleton on the A65 to Devil's Bridge I drove along the A683 from Kirkby Lonsdale to Sedbergh with a wide grin on my face. I was excited and raring to go. I had planning an extensive exploration of the Howgill Fells for some years and this was the day I would finally get to do it. 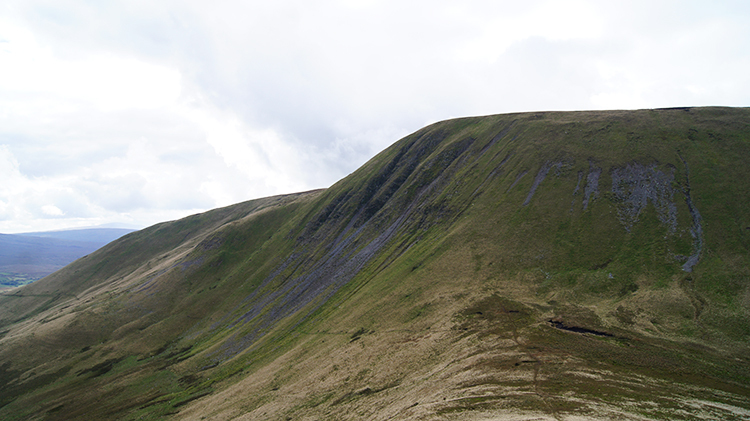 On other occasions I had been walking the Howgills it had been confined to the south side with Cautley Spout and the Calf occupying my attention. 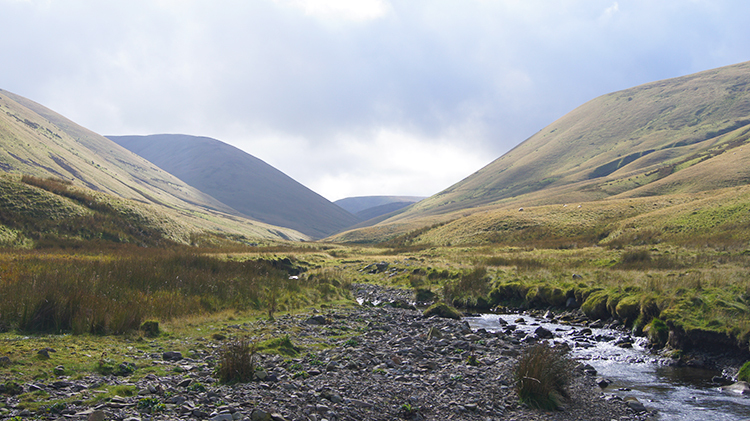 While I loved that walk, which I had done quite a few times I had never ventured to the north side of the Howgill Fells. This time I was determined to explore the north of the fells and in doing so walk across some of Wainwrights slumbering elephants. First though I had a familiar path to follow. 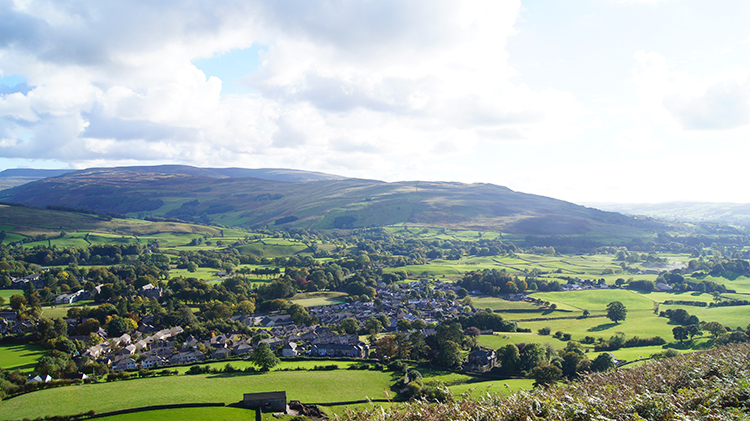 The first time I had visited Sedbergh I was with a girlfriend and we had climbed up from the town to Winder before taking in the view and heading back down into town. 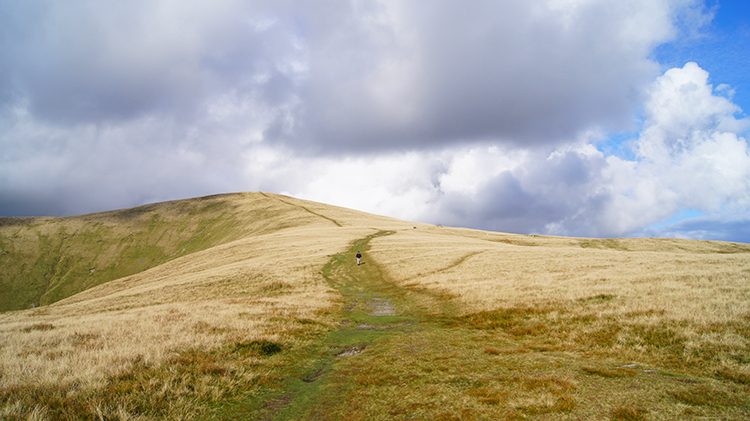 I started my walk by following the path to Winder once more, remembering every step of the steep climb as I did so. This time though I kept going from Winder to pass the higher hill of Arant Haw. I never touched the top of either, saving them fro the return journey. 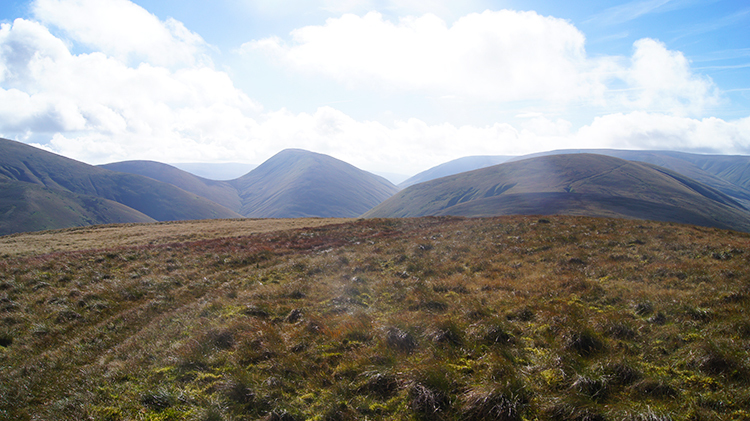 As I climbed the wonderful rolling terrain of the Howgill Fell uplands began to unfold in front of me. It was a gorgeous sight, so inviting and magnetically drawing me towards it. Grass dominates the Howgill Fells. The range, which is found directly between the Lake District and the Yorkshire Dales are unlike either of their illustrious neighbours. Neither rocky and craggy like the Lakeland mountains nor gritty or limestone of the Dales the Howgill Fells are soft and beguiling, being grass covered almost throughout. Due to their location and partly effected by the wild ponies of the Howgill Fells the grass is kept short making it perfect to walk over. It always had been for me anyway and starting out on this walk was proving same. Though the walked paths had erosion of grass in some places it was never bad. It never is. 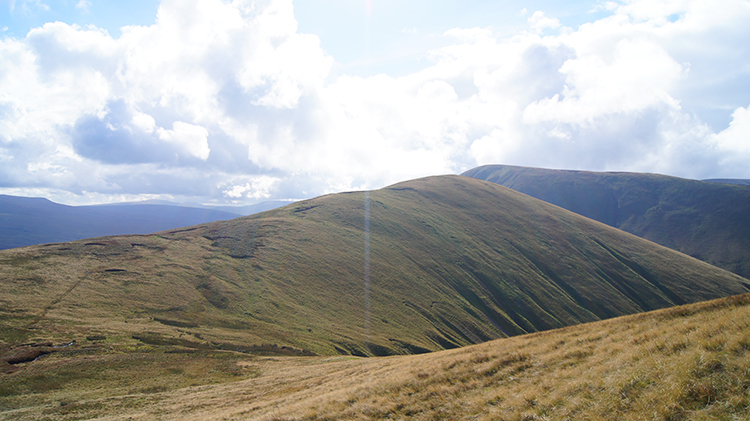 I continued climbing past Arant Haw and across Rowantree Grains on my continuing climb to the Calf, the highest point of the Howgill Fells. I had the whole range to myself, such is the enigma of the range. Indeed I was early so not seeing other walkers was not wholly unexpected but the fells never gets the footfall they merit. Maybe I should keep quiet and let it remain this way. I passed Calders at 674 metres and then I passed Bram Rigg Top at 672 metres. I had in fact levelled off on the top plateau of the Howgill Fells and in doing so I had already climbed over 550 metres of my day walk. I can honestly say I hardly felt it, certainly not after passing over the edge of Winder. The climb had been gradual, no sudden kicks upwards bar a short haul around the tongue of Calders. I reached a very familiar trig pillar at the Calf and rested for a while to take it the atmosphere of the place. It was quite, broody and moody. Some clouds were swishing across the sky and I hoped they would not fill it. I wanted the sun to kiss my Howgills. Then a walker approached the trig pillar and without stopping greeted me. There was someone else enjoying their early morning on the Howgill Fells after all. 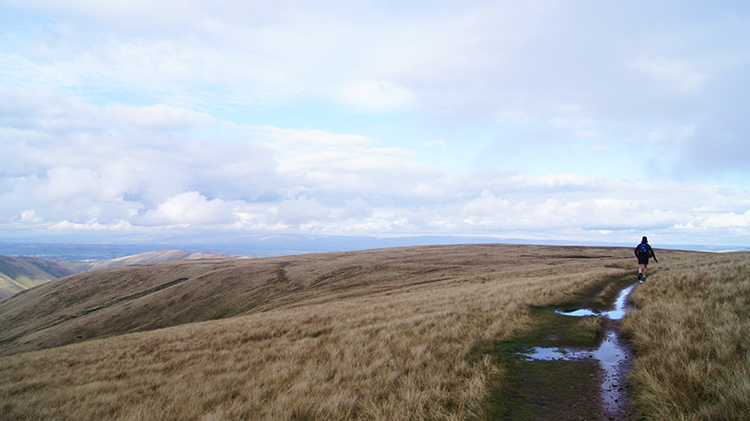 The other walker on the Howgill Fells kept walking northwards and into the distance. 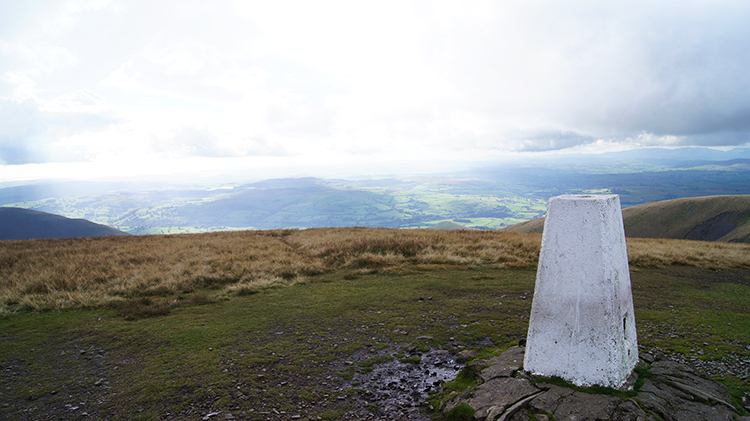 After my break at the Calf trig pillar I followed the north course to Hazelgill Knott. On the way there I crossed over a couple of small unnamed tops, akin to dimples on a table tennis bat. It was as if I was walking across the even ups and downs of a stationary fairground waltzer as I went along. As I walked the easy path I looked over to the other Howgill Fells in view which included Randygill Top and Yarlside. I would mount both those slumbering elephants later in the day. or now though I kept on walking north along the central spine of the range and after breasting Hazelgill Knott, at 578 metres I crossed a few more of the unnamed dimples. From one I looked around into the quiet valley of Langdale. It was an awesome view. Not a sound lifted from the dead calm valley. Quite serene and utterly surreal in this mad world of noise. 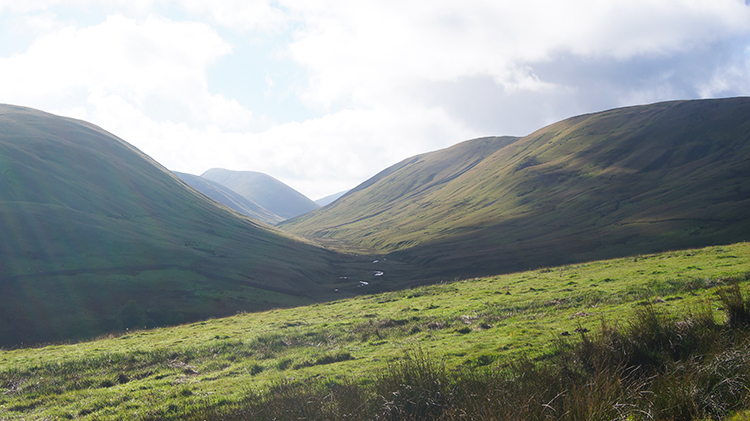 The Howgill Fells were so quiet and altogether disarming. I noticed that I had been walking in pure silence. Around the mid ground of Hazelgill Knott all had noise trying to penetrate the fells had been muffled by the grassy uplands all around me. The Howgill Fells were natural earmuffs. Only when I began to fall off the south side of the Howgills after topping West Fell did I noticed sound penetrating to my attention once more. And only then was it the baa of sheep grazing on the north facing slopes of the Howgills. Then I listened more intently to pick out the drone of farm traffic working the fields of Lune Dale. I looked due north across the dale and across the sparsely trafficked A685 to the limestone outbreaks of Great Ashby Scar. I imagined back eighteen years, a generation since I last crossed them on a Coast to Coast journey. Then I turned my attention to Bowderdale, another old friend. I walked down from West Fell into the dale I had not walked through for twelve years. "Hello old friend" I said to myself. It was a wonderful moment when I stepped into the bottom of Bowderdale and walked southwards and upstream along the trickling beck of Bowderdale. The last time I had walked along the dale my peace had been shattered by an army helicopter passing over my head. It had been very low and very noisy as the crew clapped eyes on me and flew on by on a south course. This time a much quieter drone came by, that of a light aircraft chugging across the sky at a much higher elevation. It was unlikely this pilot had spotted me. After it had gone all fell quiet again. Except for the trickle of the feeble water in Bowderdale Beck. I guessed with little rain in summer the upper beck would fall dry. In any event I crossed it on my October day and hardly wetting my boots. I then began my second significant climb of the day up Leath Gill. After the relaxation I had enjoyed for the past hour or two it was quite a shock to be applying effort again. And with the warming of the midday approach I sweated on my way climbing up the gill. It took me a few breathers before I climbed to the point when I parted way with Leath Gill to begin the climb of Randygill Top. Some hills appear to say "Come on, hurry up and climb me". Randygill Top is one of those hills. From the north side approach I was taking Randygill Top looked like a Christmas Pudding. I wanted to be the cherry on top! It was not that easy to climb though, the path was a steep one and it made me take my time getting up to the top. 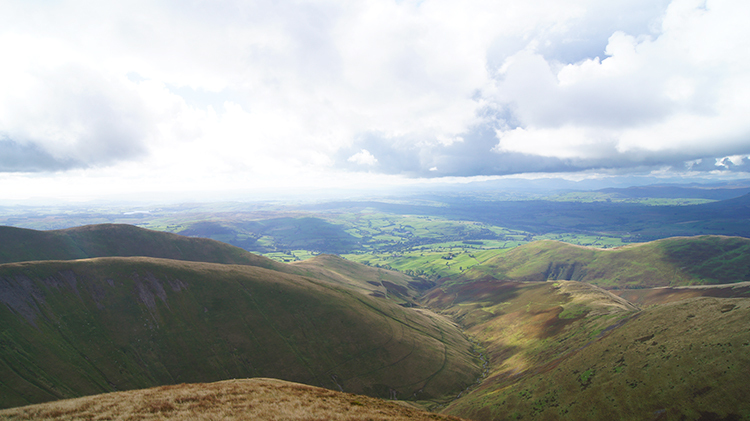 As with the climb up Leath Gill I had to take a few breathers while I ascended. The stops were well worth taking though because of the views I enjoyed, particularly the one looking straight across Leath Gill and up the slope of neighbouring Hooksey. The view east to Green Bell was also well worth it. The only trig pillar of the Howgill Fells I have not touched is on Green Bell. At 705 metres I would like to touch it one day. Eventually I reached the 620 metre summit of Randygill Top and became its cherry on top. More brilliant views came about on my cresting of the hill including ones to the North Pennines and Northern Yorkshire Dales in the north-east and to Harter Fell on the eastern extreme of the Howgill Fells. "That's it" I thought "Harter Fell and Green Bell are the features of my next Howgill Fells walk". From Randygill Top my next objective was the neighbouring hill of Kensgriff. The walk between the two was brilliant. First I bounded down the south-east side of Randygill Top to a point above the head of Great Randy Gill. Bounded may not be the appropriate word. Perhaps I bounced down the springy hill. From beyond the head of Great Randy Gill I then climbed the exquisitely natural ascending ridge of Kensgriff. As with my bounce down Randygill Top the climb to Kensgriff was thoroughly delightful. It really was and I gained 50 metres height while walking the full length of the ridge line. Then once at my Kensgriff summit I noticed my next climb would not be so much fun. I thought to myself "Flipping heck, that looks steep". Yarlside looked a right bugger to climb from Kensgriff and that is a fact. I had it to do though so I did not dilly dally, running down the south-east bank of Kensgriff to reach Little Randy Gill Saddle. Then I looked up the steep east face of Yarlside and decided on my course. I climbed straight up beside a scar in the hill. Sometimes I needed to use all fours. Sometimes I needed to grip grass clinging on to the hill. I had to cling on too. Quite often I had to stop and catch my breath. I had to stop a lot. Sometimes I looked up Yarlside to see Sheep looking down on me. Sheep were on Yarlside and having a laugh looking down on me while I struggled up the steep bank. It seemed that way. I made it up Yarlside and I was knackered. The climb had been a real tough one and I was in need of a proper break. It was well into the afternoon and at 1.45pm I sat down by the modest stone cairn on Yarlside to enjoy my lunch. And wow did I enjoy it, a much needed break of sustenance and rest. 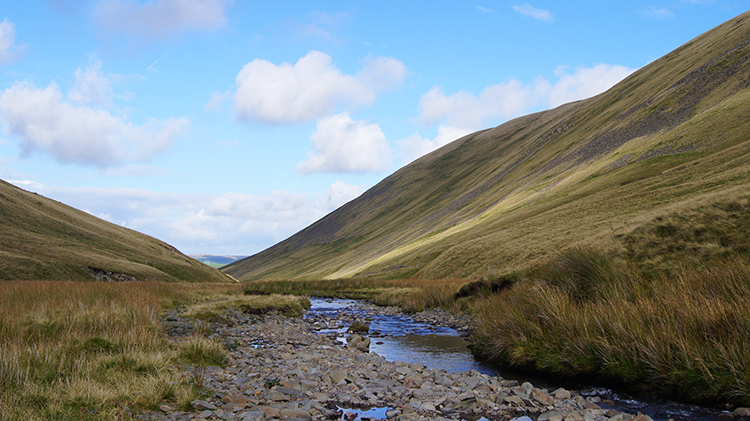 I was so thrilled as I took my leave of walking, reflecting on the sumptuous walk in the Howgills so far. I thought to myself "This place is enchanting. I have seen so many new things and enjoyed them already. And there is more to come". I did so look forward to it. The views continued to excite and the sun continued to fight with the clouds. It was an even contest, spells of sunshine were intermingled with equal spells of shade. Still the views were widespread with swathes of upland Northern England providing a natural landscape gallery. 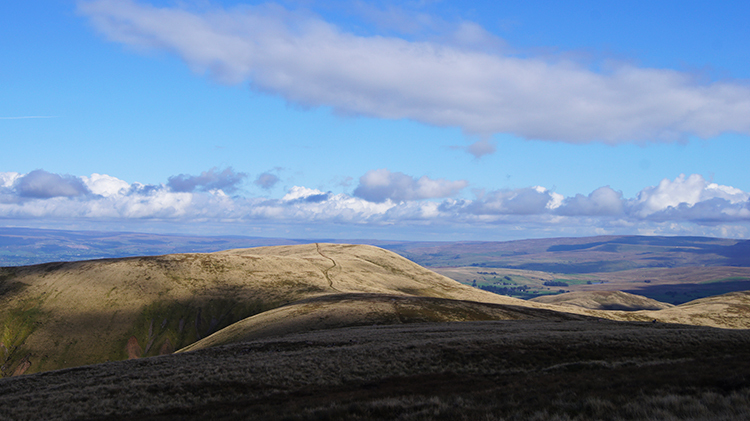 After my lunch I descended from Yarlside by way of no path, a chosen heading directly to Bowderdale Head. (Note paths are not showing on the maps for parts of this walk but never did I feel there was risk. This is an easy route on gentle slopes. With care and attention to choosing your course you can do the same). As I walked down the unmade slope I saw a group of people climbing on the path from Bowderdale Head towards the Calf. I would follow them. Then I saw a couple of walkers heading into Bowderdale. People were on the hills now. I got myself down from Yarlside safely and across Bowderdale Head easily to climb on the path back up the the Calf. My adventures would soon be done, I would be returning home by the same path on which I had came. 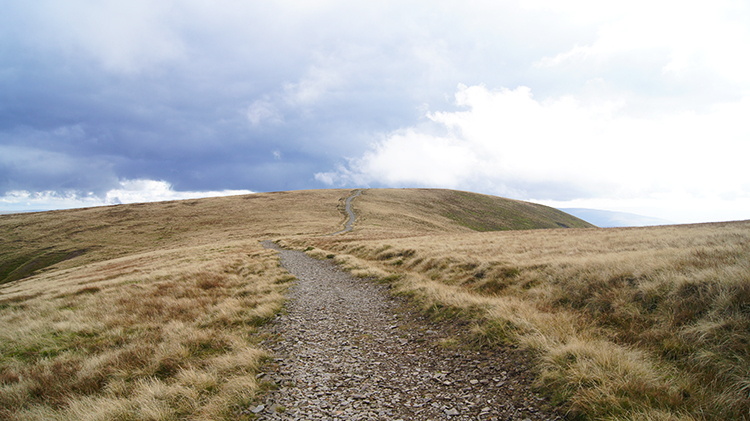 I passed close to the Calf and followed the path I had walked along earlier in the day back to Bram Rigg Top which, as are most Howgill Fells, marked by the smallest of cairns. 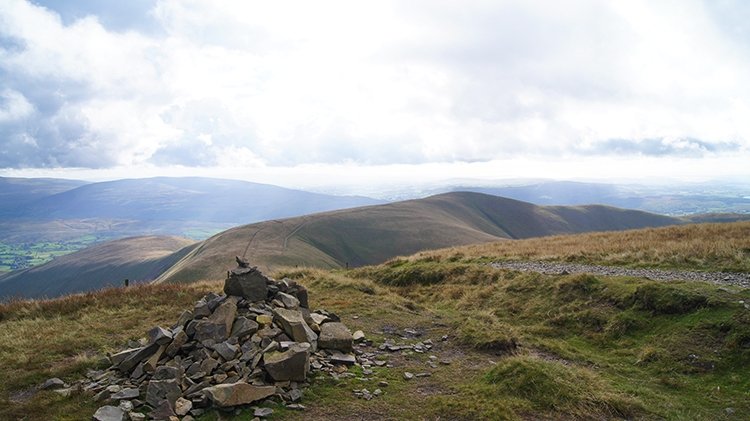 Loose stones are hard to find on the grassy Howgills, natural material for cairns on their hilltops are hard to find. 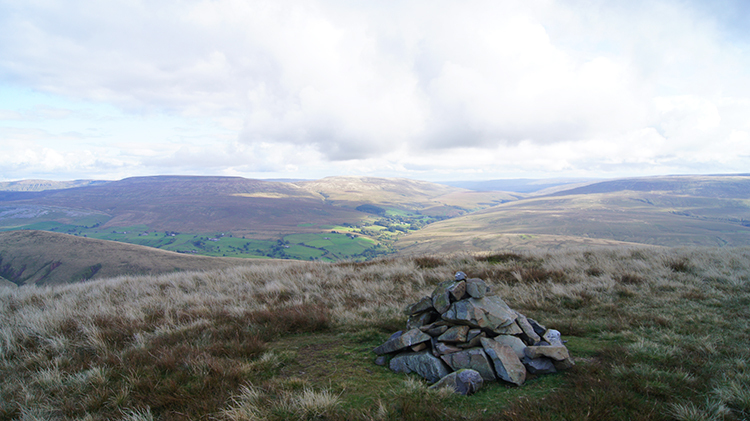 From Bram Rigg Top I soon arrived at Calders and its diminutive cairn from where I looked down at the dales of Rawthey, Hartley and Lune bathing in late Autumnal sunshine. Beyond Rawtheydale both Whernside and Ingleborough shimmered with inviting allure in the distance. It was another gorgeous sight, the latest in a continuing succession of attractive scenes on this tremendous Howgills Fell walk. I descended further towards a fitting finale. 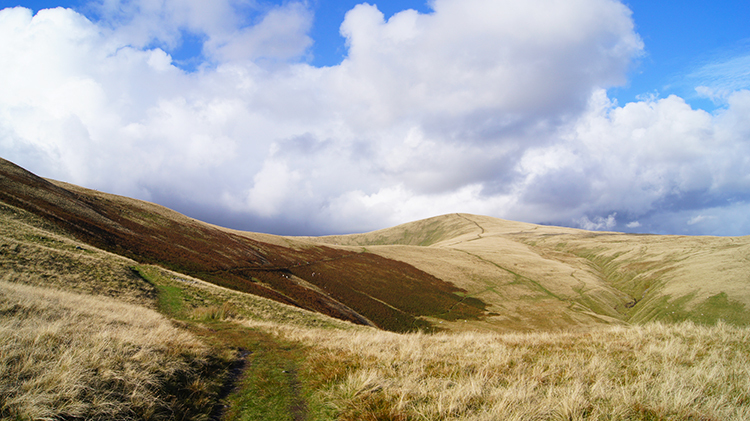 I followed the path across Rowantree Grains which I had used as my access into the heart of the Howgill Fells earlier. As I did so the striking curves of Arant Haw presented an invite to which I could not ignore. Thus I left the path crossing the east side of the hill and climbed to the smooth summit. It was a pleasure and a privilege to stand at the summit and look around. Due east and across the M6 gap I viewed the rooftops of Kendal. Due south I looked down to my starting point in the picturesque town of Sedbergh. Directly beyond Kendal I looked at the uplands of Middleton Fell, another of the places I have not yet visited. 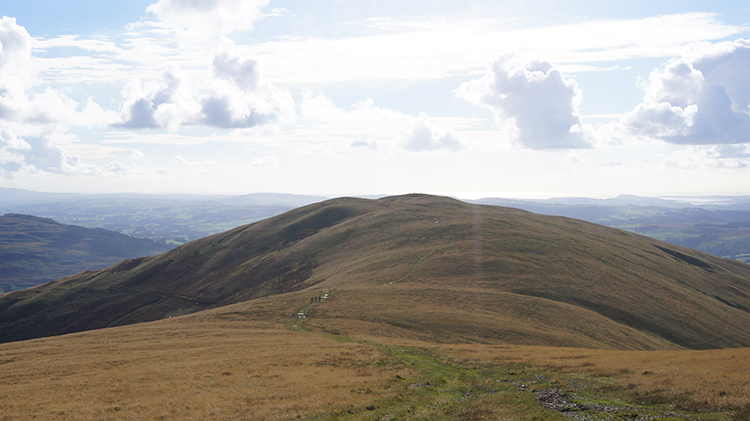 I noted I must climb Middleton Fell and then I walked down from Arant Haw and reclaimed the path towards Winder. 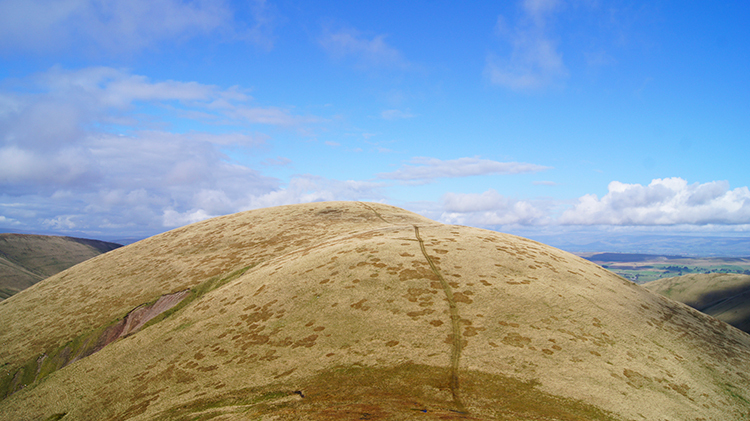 As I had done on Arant Haw I left the path I had followed earlier to divert to the summit of Winder. 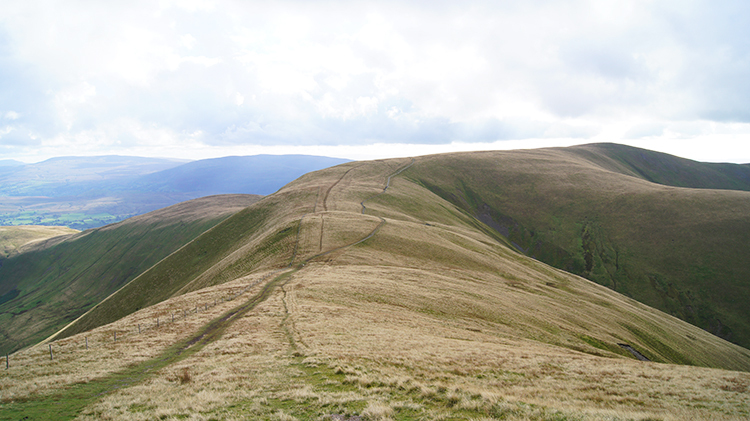 At just 473 metres it is one of the smaller hills of the Howgill Fells but its prominence sitting over Sedbergh gives it a much loftier aura. And Winder is complimented with a trig pillar making it an attraction to hill baggers. 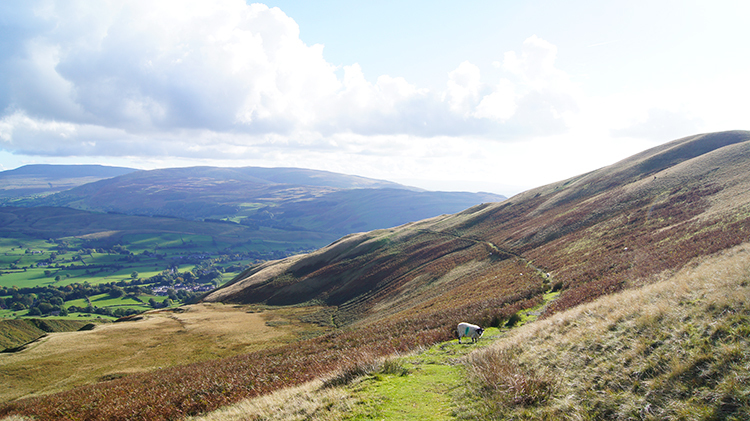 Winder is respectful and I completed my walk of Howgill Fell hill top visits by patting the trig pillar before skipping back down the Sedbergh path and then ambling sensibly on the steep descent to the town. 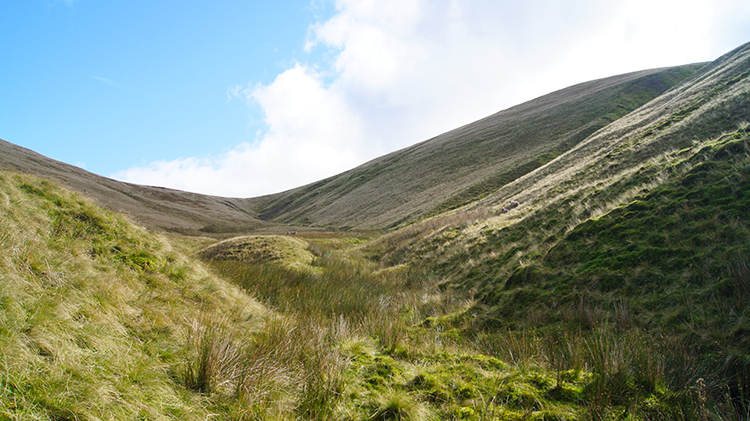 I was joyed as I walked the path down off the Howgill Fells and though tired in limb I was hale in mind. I walked through the paddocks of Lockbank Farm as everyone must do to access the Howgill Fells from Sedbergh A couple of farmers were shuffling sheep into a corral but still had the time to greet me with "Good day, it's a grand one" as I passed. They will have done it many times to many weary walkers leaving the fells and most will have appreciated their words. After the farm I followed lane and road into town and found a cafe. 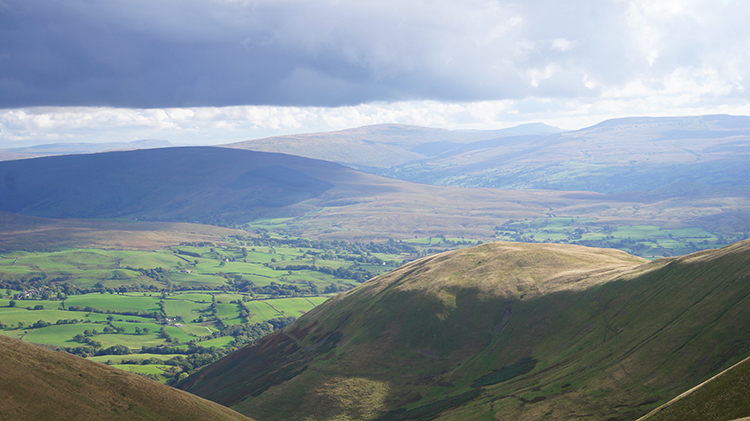 I sat down and relaxed with a lovely pot of tea and a scone while reflecting on my magnificent Howgills Fell walk. It was a suitable ending.